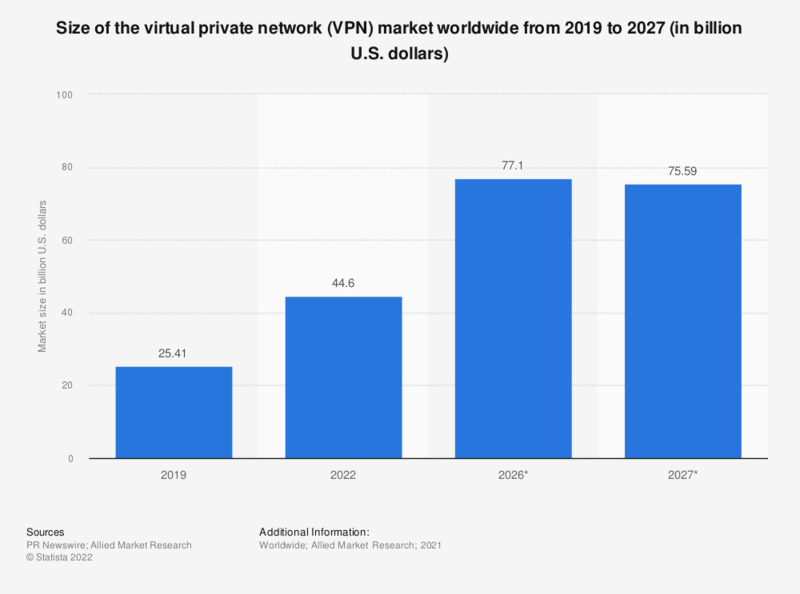 The statistic shows the size of the virtual private network (VPN) market worldwide, from 2016 to 2022. In 2022, the global VPN market is forecast to reach 35.73 billion U.S. dollars. Virtual private networks are designed to extend a network securely from a private location, such as a business or home, across a public network, as if the network were directly linked. VPNs are popular among consumers for obfuscating their real location, whether to access geo-blocked services or bypass censorship or other restrictions. Among enterprises, VPNs are often set up to allow employees to access corporate intranets while travelling or working from home. The figures from 2017 to 2021 are calculated by Statista based on the market revenue figure for 2016 and 2022 provided by the source and the CAGR of 14.77% from 2016 to 2022.